HandyBot - catchy puzzle game about a cute robot with only one but very handy arm. The goal of the game is to get to the hatch that leads to the next level. Main and the most important objects in the game are boxes, every box works differently, and you have to find out how. Sometimes you can just pull a box to yourself, and sometimes you have to drag yourself to the box. Some boxes are magnetized and...oh, we don't want to spoil everything! After getting Greenlit on Steam, we decided to focus on a mobile version of HandyBot first and we are happy to announce that Official HandyBot Trailer for iOS and Android is 100% done. In HandyBot you control a cute robot with only one, but very handy arm, the goal of the game is to get to the hatch that leads to the next level. Make your way by pulling and dragging boxes. Think outside the box and rescue the Astronaut! The game will be "soft launched" just in Poland this Friday. The rest of the world have to wait few more weeks (but it's worth waiting! - we will add more features to the game before the "hard launch"), but if you want to become a tester now, just leave us a message with your Apple ID and we will add you to the Test Flight group! The game will be free to play with no micropayments! Gamespol is now working on HandyBot's mobile version! Adorable puzzler is going to be on your mobile phone! HandyBot is now on Greenlight! HandyBot - adorable little puzzler is now on Steam Greenlight! How to steer a cute little robot? How to steer a cute little robot? Here are some gifs showing it! 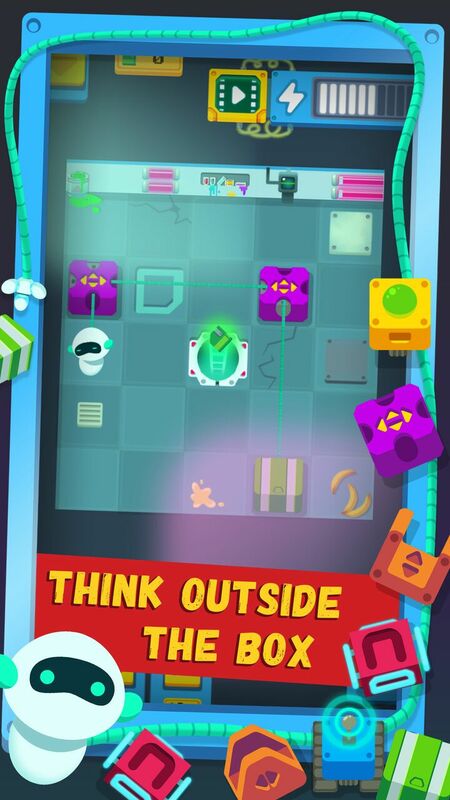 HandyBot - catchy puzzle game! HandyBot - catchy puzzle game about a cute robot with only one but very handy arm!